There is a wealth of internet information dealing with staged events, often called “psy-ops”. A more common term would be “false-flags”. I don’t believe that anyone can deny the existence of such public brainwashing schemes, as they are commonly acknowledged by the responsible authorities or people definitely in the know, at some time after the event. There is usually little doubt as to why false-flag events, including ones which trigger serious war situations, are created. The reasons are generally quite clear, if not obvious. One of the curious factors is that the public are so reluctant to believe that they have been brainwashed, even after conclusive proofs are presented. The main reason why the public are initially convinced of the “authenticity” of these operations is the whole-scale connivance of a corrupt media. Why they cannot later figure out the significance of inconsistencies and lack of meaningful supporting evidence, or at least be prepared to doubt the official stories, is something for psychologists to ponder. This article published by “The Crazz Files” ( The Crazz Files Is A Totally Independent Australian Website & Podcast Show. ) is linked here, and provides compelling evidence of the staging of a number of recent events. The first part is copied here, the source article is very informative and analyses the procedures involved, making it clearer to readers how to understand the ‘ungodly’s actions and agendas. 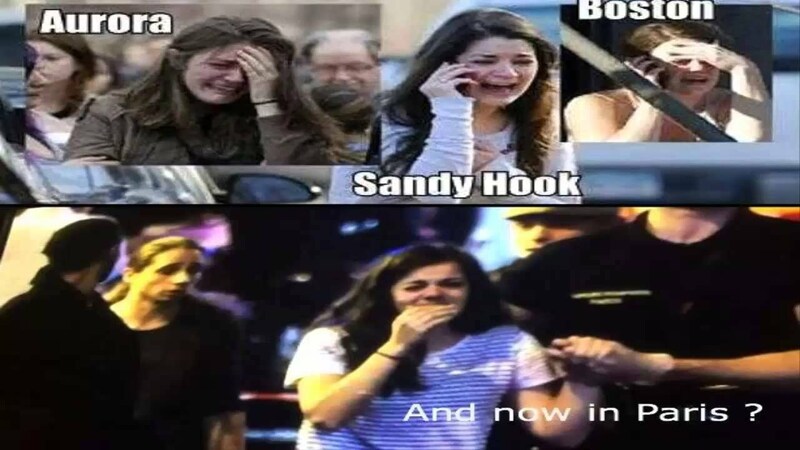 This entry was posted in 'WAR on(of) TERROR', Conspiracies, Corruption, Media, World Issues and tagged Crisis Actors, False-flag Events, media, Public Brainwashing. Bookmark the permalink. 5 Responses to False-Flag Events. Here is your invitation to the unveiling of the source of energy that made all of the elements, birthed the solar system, and sustains every atom, life and planet.